A Bloomberg article published in September 2018 highlighted a positive trend: credit scores have hit a record high. Notice the correlation between the age group of the credit holders and their score. 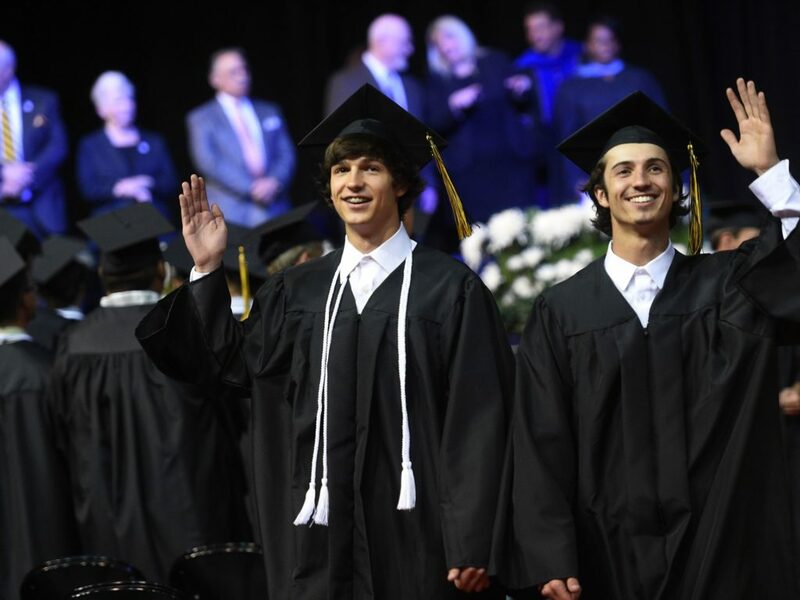 These are my sons, Dexter and Tate, at their Galena High School graduation. Luckily, none of my four children have incurred student loan debt from college. This is unsurprising to most of us. However, the article notes a more concerning trend: student loan debt is the second-highest debt we have as a nation. It ranks second only to our housing debt. Of course, there is one gigantic difference between the two: housing debt is at least secured against a tangible asset. That’s better for the borrower and the lender. This isn’t the case for student loan debt (unless you count the paper diploma). The amount of money our young people are borrowing for higher education is out of control. It is well known that when debt is cheap and easy to get, people take advantage of it, despite the adverse effects. Hopefully we can start to turn this trend around. Don’t let your young whippersnappers get themselves too far in debt! Check out the entire Bloomberg article below. By Suzanne Woolley | Originally published in Bloomberg. September 24, 2018. Fueling the rise is the fact that fewer consumers have truly horrible scores (less than 550) that could drag the average down. In the last year, the percentage of Americans with one or more collection accounts on their file has fallen to 23 percent, from 25.8 percent. Since payment history makes up 35 percent of a FICO score, the drop in delinquencies has more people moving up into the 650-to-699 range. Demographically, the new credit score high is the product of conscientious baby boomers and Generation Xers. The 18-to-29-year-old crowd has an average score of 659; Americans in their 30s come in at 677; those in their 40s are at 690; while 50-somethings reached 713. Americans in their 60s, meanwhile, are flying high with an average FICO score of 747. To be fair, scores for all generations have risen, and older people have a longer history on which FICO can base their number. Moreover, people in their 20s and 30s are often buried under a mountain of debt, thanks to the college loan industrial complex. On this last point, it’s worth noting that fintech firm Lending Tree recently reported that America’s $1.5 trillion-plus student debt load is second only to housing-related loans. A FICO report published on Monday had one dark spot. The percentage of the company’s score population with bank card accounts more than 90 days past due is 8.2 percent, up from 7.7 percent in April 2017. But even this, Dornhelm said, may be a consequence of the overall upswing. “Some of that may be a reflection that lenders started loosening underwriting criteria a bit, so [they] are bringing in a near-prime population that is more likely to default,” said Dornhelm. He added that banks likely baked that into their pricing. The new record comes on the heels of other signs consumers are finally shrugging off a recession hangover, despite stubbornly stagnant wages that haven’t matched mushrooming corporate revenue. Consumer confidence is at its loftiest level in 17 years, unemployment is near a 50-year low and household wealth—fueled largely by those who own stocks or property—rose by $2.19 trillion to hit a record $106.9 trillion in the second quarter. That’s fueling household spending, which accounts for roughly 70 percent of the U.S. economy. Consulting firm Deloitte LLP anticipates a record holiday shopping season, forecasting sales of about $1.1 trillion from November through January. Americans are borrowing more than ever, with mortgage balances growing at a rate that Lending Tree warns is in line with pre-housing bubble levels. The ratio of personal savings to disposable personal income is falling, from 7.4 percent in February to 6.7 percent in June. Auto lending, widely feared to be the next subprime lending crisis, has climbed steadily since the Great Recession ended, and consumers are taking longer to repay those loans. Total household debt hit a record $13.3 trillion in the second quarter, according to the Federal Reserve Bank of New York. In fact, this marks the 16th consecutive quarter household debt rose, breaking the previous record of $12.68 trillion. The old record, coincidentally, was reached exactly 10 years ago, during that decidedly unpleasant third quarter of 2008.